Currituck County was announced on April 3, 2019 as one of five winners of the North Carolina Department of Transportation’s inaugural Mobi Awards. The Mobi Awards were created to honor towns, cities, and counties throughout the state for completing projects that incorporate different modes of transportation to make local travel easier and more efficient. ​​Winners were chosen in five categories – Rural, Suburban, Urban, Tourism and Innovation. The Corolla Greenway was selected as the first place winner in the Suburban category. Currituck County also tied with the City of Raleigh for first place in the Innovation category for development of the Corolla Village Road beach access. The Corolla Greenway is a 4.5 mile paved path that runs along NC 12 on the Outer Banks and has been developed in phases. The Greenway is 10′ wide, fully ADA-accessible, and includes pocket parks along its route. Along with providing opportunity for healthy recreation, the path allows pedestrians and cyclists to safely move along NC 12 and connects neighborhoods to destinations such as shopping and beach access points. The Suburban category specifically recognized phase three of the Greenway’s development, which connected Ocean Sands to Monterey Plaza. Currituck County’s win the Innovation category focused on phase four, which featured the Corolla Village Road extension and ADA-compliant beach access ramp. The county’s funding for the project has been supplemented by grants from the NC Parks and Recreation Trust Fund. A project to extend the Greenway an additional mile is currently underway and will be completed this spring. 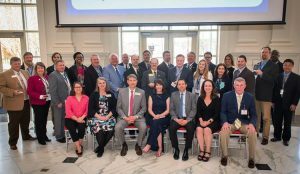 Bob White, Chairman of the Currituck County Board of Commissioners, and Eileen Wirth, Project Coordinator, attended the Mobi Awards ceremony in Raleigh to accept the award for the county.